When you think of something being endangered, you probably automatically think of animals. In the entire world, there are about 5,000 endangered species of animals, and despite the importance of protecting these endangered animals; there is also an importance in protecting endangered trees all over the world. Arbor Day has just passed and this is a good time for a reminder that there are trees in every country that are slowly becoming extinct. This is often due to deforestation and the fact that the wood of most of these trees is used for making lumber as well as furniture, flooring, and even the handles on knives. While you might not think about it every day, trees are especially important. For one, trees are able to produce oxygen. It is said that one matured tree can produce enough oxygen for ten people to breathe for one year. Trees are also good for cleaning soil as well as the air. Carbon dioxide is a huge problem in today’s world, but trees are able to absorb and hold onto carbon dioxide as well as sulfur dioxide and even nitrogen dioxide. If you’ve ever been to the Hawaiian Islands, you’ve possibly seen one of these trees during your visit. The 25 different variations of this tree are found on each island, some growing as large as 60 feet tall. Each island has its own species and every species is distinct, not only in size but where they grow and the color palm it provides. The trees only have one trunk and have various branches that grow palms on the end. There are young Loulu trees in many home gardens – you can grow one of these trees in a pot until they start to mature; however, there are only about 300 Loulu trees in the wild. 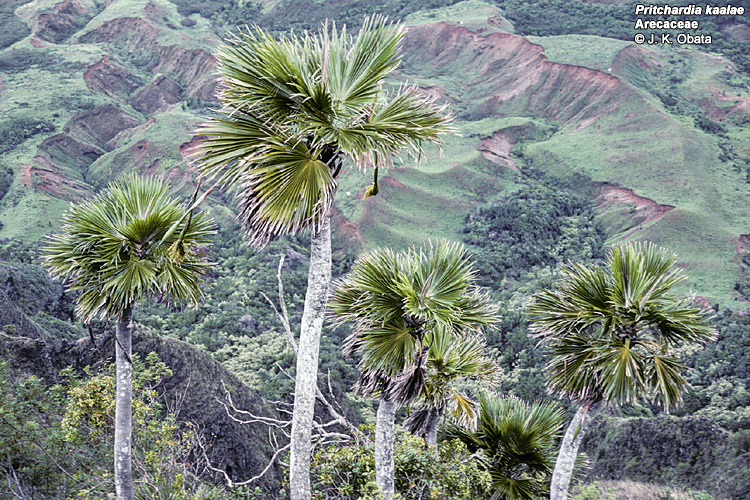 The Loulu tree has been living on the Hawaii Islands for around 40,000 years. The Polynesians who used it for making spears and thatching first brought it there. The trees flourished until the ancient Hawaiians arrived, bringing pigs and other animals with them that either ate the seeds or ruined the roots of young trees. Thankfully, to slow and hopefully turn around the decline of these trees, the Oahu Army Natural Resource Program has began collecting and growing seeds, allowing them to mature and then planting them at a time when the tree is sure to survive. Photo: botany.hawaii.edu. You’ll find this tree in Mexico, mainly the southeast corner where there are three known species that thrive in the dry desert areas. The neat thing about the Hinton’s Oak tree is that the spring foliage is a bright red color that eventually turns to a dark green before they fall off. The bark of the tree is extremely dark, which sets a contrast to the red leaves. The trees can grow as large as 49 feet and are extremely important to many in Mexico, as the wood of the tree is made to use handles for many utensils, such as knives. Due to the growing need of agricultural locations in Mexico, the Hinton’s Oak is declining in numbers. Road construction, more planting fields, and coffee plantations have all taken over the land that was once inhabited by the Hinton’s Oak. These trees are also sometimes cut down for firewood. It is said that the smoke the tree gives off has a very distinctive smell and taste and because of this people will use the wood to bake bread called “las finas” (“the fine ones”). The tree has also decreased in population due to grazing by livestock, which is known to prevent trees or any kind of tree from regenerating year to year because the animals eat the seedlings that would produce a new tree. Researches from the University of Puebla and Sir Harold Hillier Gardens and Arboretum in the United Kingdom are working together to create a conservation plan for the trees. The St. Helena gumwood is definitely unique. In fact, it’s so unique that St. Helena Island chose it to be their national tree. The tree grows with a crooked trunk, but despite this it is able to support an umbrella-like canopy with an endless amount of branches. During the winter and into the end of the spring months, each branch produces white dangling flowers. Accompanied by the flowers are leaves that can be up to 5 inches long. Not only are these leaves somewhat large, but they are also hairy and can be a green color while others have more of a grey tone to them. In St. Helena, the population of this tree was once so large that is covered tropical forests all over. When it comes to the St. Helena gumwood tree, the main problem is humans. Many people who have access to these trees often cut them down and use them for building as well as for firewood. This has probably happened since the beginning of 1659 when the island was first settled. Also, some type of animal often accompanies settlers. It’s said that the St. Helena settlers brought goats along with them that often ate the seedlings that freely fall from the existing trees each year. In 1991, the population of the tree was hurt immensely when the jacaranda bug attacked them and took the sap from the trees and promoted black mold growth. Not only have these events caused a drastic decline in population, it’s also leaving many rare and unusual species of animals without a home. Because of this decrease, the Millennium Gumwood Forest Project has decided to help regenerate the gumwood tree. Ten years ago, 4,300 trees were planted at a location that was once a wasteland. Photo: St. Helena National Trust. In Swahili, the population of the African Blackwood continues to diminish. The name comes from the color of its heartwood which is a color closely resembling black. The tree is said to grow in areas where most other trees or plants couldn’t, as it prefers infertile and rocky soil. The Mpingo is also very slow growing, taking between 70-200 years to grow to a mature size and many only grow to be able 9 feet. tall. It is the national tree of Tanzania even though the tree can be found in about 26 different African countries, including Ethiopia, Angola, Senegal, and many others. This tree is great for those who do agricultural work as it is known to improve the fertility of the soil as well as the soil’s stability. The Blackwood is a great source of food for various herbivores as well as livestock as these animals will eat its leaves. Despite being a very hardy tree (most of the mature trees are even able to survive a fire), the population of the African Blackwood has been on the decline. The extremely dark heartwood of the Blackwood is definitely one of the most widely sought after timbers in the entire world. Some of the highest class instruments, mostly woodwinds, are made of this wood. It is also used to make furniture as well as for carving purposes. Carving this wood has been done since the 1930s, but today it’s extremely hard for the carvers to find enough wood to use, which means many times that the timber is imported. The trees are often harvested for this timber and other seedlings are rarely planted in their place. Even though mature Blackwoods can survive a fire, the seedlings cannot, which greatly slows down regeneration. The African Blackwood Conservation project is working each day to help regenerate these trees because they are declining in population so rapidly. The group plants new trees each year in hopes that the tree population will be replenished. Seedlings are grown at the Moshi Mpingo Plot and the transported to a place where the tree can mature. Photo: African Blackwood Conservation Project. Just by the name, you can probably tell that this is a pretty unique type of tree. Represented as the national tree of Chile, the Monkey Puzzle can be seen all over Europe, especially in botanical gardens. Sometimes called the living fossil, the Monkey Puzzle can live thousands of years. In Chile, the tree is known as Pehuén to the Pehuenche people. These people have a large history with the tree and often need it to provide a great part of their diet. The Monkey Puzzle tree provides nuts that people as well as animals often eat and are said to be very similar to pine nuts. The tree grows to about 131 feet tall but has a very slender trunk. The branches are often described as being thick and reptilian and the tree as a whole prefers to grow somewhere with a lot of rain, and cold temperatures aren’t a bother. Because of things such as logging, grazing, and fires, the forests once made up of Monkey Trees are slowly diminishing. The timber is often used for building bridges, roofs, boat structures, furniture, and plenty of other things, but this is mostly due to the fact that it is resistant to fungal decay and also has a lot of mechanical resistance. Many forests have been cut down and used for tree farms, which seems a little ironic- cutting down trees to grow different trees. In essence, it seems that a lot of Central American countries have a hard time taking good care of the forests within the various countries. In any case, various plans are in the work to rebuild the Monkey Tree forests. Up to 10 million acres of land will be home to new trees and this project should be done in about 12 years. You can find the Honduras rosewood in Belize, Southern Mexico, and Guatemala. They are on the endangered list due to the heavy use of its lumber for various products. The timber produced with this wood is said to be some of the best but surprisingly, there isn’t too much information known about the tree. The wood that is taken from the tree is often of very high quality and the color is what really attracts people. The wood is usually a red purple color with streaks of black. The wood is so unique that people from all over vie to own some of it. The timber made from the Honduras rosewood is highly valuable. A lot of this wood is used to create musical instruments such as guitars and various other stringed instruments. It is most used to create claves and xylophones due to the fact that the timber is said to be heavy and very durable which allows it to provide a very loud but clear note. Also, the wood is often used for carving. Sometimes you’ll even find that the wood is used as a covering for cabinets, knife handles, and even furniture. Sadly, a lot of these trees are being used, but there isn’t nearly as many of them being planted, so the population continues to decline. It’s said to be the worst in Belize where slash-and-burn agriculture is widely used. To help build up the population again, the Ya’axché Conservation Trust (YCT), the Global Trees Campaign, and the Government of Belize’s Forest Department are all working together to plant Honduras rosewood in private forest reserves so that they can grow and begin to flourish again. The group hopes to plant about 7 tree seedlings per hectare. Often characterized as a majestic tree, the clanwilliam cedar can be found throughout the Western Cape Province of South Africa, especially in the Cederberg Mountains. The trees are extremely tall, growing up to 82 feet in height and they like to take things slow: some of these trees can live to be up to 1,000 years old, and it takes almost 30 years for a tree to produce seeds. The tree has foliage that is needle-shaped and is close together. The foliage often produces small cones at the end of each small twig during the autumn months. Like many other trees on this list, the Clanwilliam cedar is on the endangered list of trees because of the wide need for its timber. The timber that the tree provides is often used for building because it is rot-resistant, as well as for telegraph poles and even for furniture. The tree has been widely used since the 18th century, if not longer, especially by the Europeans. The trees have also slowly been taken over by fine bush vegetation, which often clogs up the habitat needed for a new tree to grow. Besides being used for timber, the tree is also prone to being in areas that are prone to wildfires. Many of these fires destroy the already existing trees and ruin those that have yet to even fully grow. In 2000, 200 hectares of the Clanwilliam cedar trees were burned because of a fire. In the 20th century, logging of this tree was banned but the trees have not been able to make a strong recovery due to fires. A Cedar Reserve has been created to provide land that will allow the trees to thrive. The reserve also collects and plants seeds to encourage new growth. Photo: UNEP World Conservation Monitoring Centre. If you’ve ever seen The Lion King, you’ve seen a Baobab Tree. It’s the one Rafiki makes his home. The African Baobab tree is another on the list that has a long history. It is said that some of the trees in existence today have been around for at least 1,000 years. You will find these massive trees, often growing up to 82 feet in height, in the Blue Nile as well as Kordofan and Darfur. Not only is the African Baobab tall, its trunk is also pretty large, measuring in at an average of 32ft. in diameter but others can be as wide as 91 feet. The tree also has fruit, which is also seen in The Lion King, ranging from 3-17 inches that has a dry powdery pulp inside of it. The tree’s fruit is used for various things such as medicine and food. The Baobab tree is on the endangered list for many reasons. For one, droughts within the tree’s habitat have caused them to not have enough water to grow properly. Also, these trees are often cut down so that people can use the trunks to store water in, which can hold about 2376 gallons of water. The fruit is also used for making porridge as well as the leaves, which can be used to make a salad. Some of these seeds are even eaten by elephants, but the elephants would be able to break the seed dormancy which will cause regeneration; however, the population of the elephant is also endangered. Because of all of this, many Baobab trees are used for multiple purposes which then cause the trees population to decline because no one is taking the time to replace the trees that were used. To help regenerate the Baobab Tree, a group known as Practical Action has come about, which aims to save this species of tree before it’s too late. They collect and plant seeds, raise awareness, and encourage others to plant Baobab trees as well. This tree probably has the coolest history on the list, but you’ll only find the Dragon Tree in Morocco, Madeira, the Cape Verde Islands, and on five of the seven Canary Islands. Tall and slender, the tree has prickly leaves with white-green flowers as well as brown berries that are recovered in a red sweet substance. The history behind this tree goes back for centuries. It is said that in Ancient Rome, the tree was used as a colorant that would cover iron tools. Many times the colorant was used as a varnish. The Dragon Tree also has history in various Greek myths. The most well known is one that tells the story of Hercules and the Apples of Hesperides. Landon, the hundred-headed dragon is killed, who was said to be the guardian of Hesperides so that Hercules could bring back the three golden apples. When the dragon was killed, it is said that various Dragon Trees sprung up from Landon’s blood, which then flowed across the land, causing more trees to grow. Though the tree has so much history, that history may soon be cut short due to the declining number in population. In Cape Verde the Dragon Tree is considered endangered. However, Brava and Santiago, two places in Cape Verde, consider the tree to be extinct. Due to animals that eat the seedlings of the tree, such as goats, rats, and rabbits, it’s extremely hard for the tree to regenerate. Fires have also been a problem for these trees. Sadly, there is no conservation of any sort for the Dragon Tree. Instead, various universities and scientists are attempting to cultivate the tree on their own. However, this doesn’t do much help for those trees that are living in the wild. The Bois Dentelle is a truly beautiful tree; sadly there are only two of these trees in existence today (both in Mauritius). This tree is not huge like others on this list; instead, the Bois Dentelle is pretty small, but the flowers that it provides are one of a kind. The flowers are in the shapes of a bell but the petals are lacy. Imagine a piece of cloth that is frayed at the end and you’ll see what these flowers look like. They are extremely distinct and only blossom between January and March. The white flowers hang off of long branches and are often in clusters. No one is exactly sure why the Bois Dentelle has ended up on the endangered tree list. Research is ongoing to determine the tree’s decline to such a low number. Many believe that an alien invasive species, namely Litsea monopetala and Psidium cattleianum, are slowly taking over the Bois Dentelle’s habitat. Thankfully the Mauritian Wildlife Foundation and the Ministry of Agriculture Division of Horticulture have been able to graft the tree, keeping it from becoming totally extinct. Only two of the first one left? Wow. Thanks for featuring our flagship species. However, please note the correct spelling of the Swahili name is mpingo. In English it is called blackwood after the colour of the heartwood not the bark. For more information about the tree please see http://www.mpingoconservation.org/mpingo_tree.htm…. In order to conserve this tree, and contribute to poverty alleviation, in future we would like musicians to buy only clarinets, oboes and bagpipes that have been made of certified wood. See soundandfair.org for more information on this. Thank you, Steve. We have made the corrections. There are a few types of woods that have “blackwood” in there commercial names. In the US, we refer to it as African Blackwood a true Dalbergia (rosewood)not to be confuse with the Australian blackwoods and so forth. It is hard to find suitable wood in this species for instrument making due to the small diameter of the trees and their tendancy to check (crack) when drying. They make excellent classical guitar back and side sets. The tonal contribution is one of reverbs and glassy sustain much like another tree on this list Honduras Rosewood. Also, I am very surprised to see that Brazilian Rosewood (Dalbergia nigra) and Pernambuco bow wood were not mentioned. I have worked with reclaimed or cities certified specimines from each of these incredibly special trees. Now I kinda wish that I hadn't used Bois Dentelle wood on my deck. Oh well, Baobab charcoal grilled hummingbird wings anyone. I cooked more than enough for everyone. Thanks for this article. The only tree I even knew about on this list is the baobab. It's good that you're publicizing these trees, and the efforts to save them. My favorite is still the baobab. What a massive, magnificent tree! This was a great list. This list is better than ANY list on listverse. Bunch of biased a**holes who care more about stating their opinions instead of facts. Thanks for the info on the Dracaena Draco or Dragon Tree. I´m actually living in Cape Verde now. I don´t know if your correct on the reason why the tree is going extinct. http://www.globaltrees.org/tp_dracaena.htm. Global Trees say´s that the tree is going extinct because a “approximately five hundred years ago the fruit of the Dragon Tree was the staple food of an endemic, Dodo-like, flightless bird that is now extinct. The processing of Dragon Tree seeds through the digestive tract of this bird helped stimulate germination. It is possible that the loss of this bird species has led to a decline in naturally occurring Dragon Trees. It is becoming very rare and seed must be manually processed in order to germinate.” Also, Cape Verdeans hold the Dragon Tree in high regard and even though their is almost no wood here, they would never cut down a Dragon Tree. The trees are a symbol of Cape Verde and a lot is done to conserve their presence here. So much emphasis is placed on endangered animals, that endangered plants are often overlooked. Both IUCN (International Union for the Conservation of Nature) and UNEP (United Nations Environment Program) will publish lists of endangered plants, where they are located, and what is being done to preserve them and replant them. Saving endangered plants is just as important, because they can provide gene pools for common plants threatened with diseases. They can assist with providing a gene pool to help stop wheat rust. I am impressed with what is being done with the mpingo. The replanting campaign is truly keeping alive the spirit of Wangari Maathai. From heaven, she can inspire us all to plant trees. In 2011 i grew approximately 75 dragon trees from seed that are doing beautifully… it was a process I admit, and i tried 4 different growing methods before hitting on the best. The article does not mention that they also grow here in the Azores islands but it is difficult to find any young plants. As with many other islands and countries, they are nearing extinction here as well. I started the program for regrowth of the trees in 2011. It takes nearly a year for them to be about 6-8 inches in height. Anyone interested in the trees and regrowth of the trees, please feel free to contact me. In fact, if you wish to add my contact information to your article on the extinct trees please feel free to do so. It is [email protected]. I would love to try to grow some of the other trees on the extinct list here so may be contacting the other growers mentioned. I saw 2-3 Monkey Puzzle trees in Italy . In some peoples gardens near Udine . Those are some spectacular trees . Wish i had 1. Your entire article was very interesting & informative. It is such a shame that these beautiful trees are endangered! I took a particular interest in ‘Bois Dentelle.’ My husband is into farming & I love to garden. Would there be any way at all for us to acquire a ‘start’ of this beautiful tree & attempt to get it started in our country? (U.S.A.) Thank you. Pam E.
According to the International Union for Conservation of Nature, Brazilwood trees are classified as Endangered. I was hoping to find the number of trees that are left but sadly some of the topics didn’t have the number of trees left. Welcome to the first modern day extinction event of our 21st century as the invasive Emerald Ash Borer causes the wild American Fraxinus Ash tree species to stop evolving since glutinous borers kill off young replacement trees before reaching seeding age. The forever loss of this “Keystone” species to the Elm-Ash-Cottonwood ecosystem will also cause chain extinction of 44 arthropods which rely on ash for existence. Ancient American Ash is our worlds progenitor to the worlds Fraxinus genome. We have a beautiful very large Monkey Puzzle tree in our Garden in Johannesburg. We need assistance in maintaining it. Is there any organization that can assist us. Quotations to trim the tree are very much out of our budget. Assistance will be much appreciated. What the heck is a butter tree? Is amboyna burl an endangered species of timber ?